What does a photograph mean to you today? Maybe an Instagram pic shot with your iPhone. Or a Facebook group photo taken with a point and shoot. Or if you're fancy, a DSLR-taken, Flickr-uploaded portrait. But what was it before? Kodak? Polaroid? 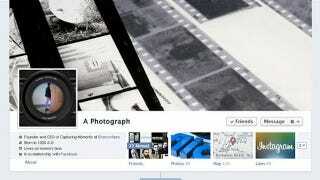 This Facebook Timeline shows you the life of a photograph, from its invention (or birth) until now.